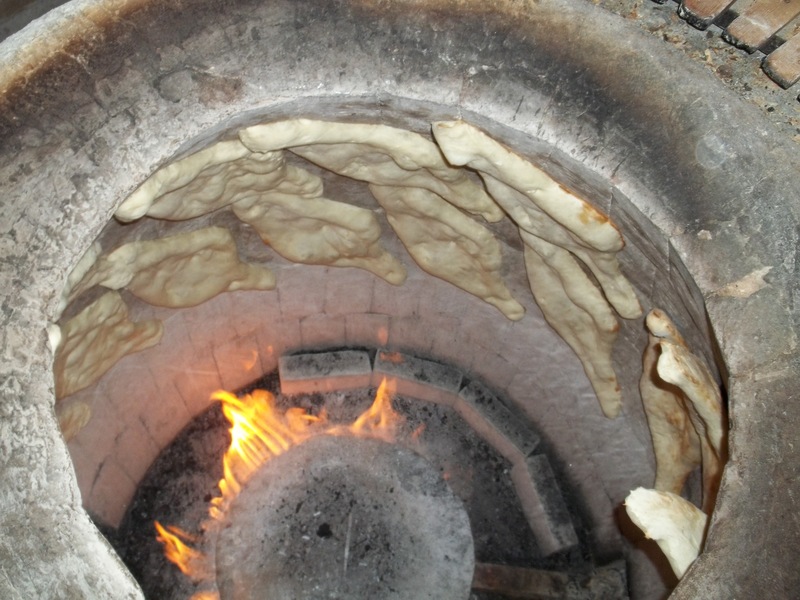 In Georgia, bread is called puri (pronounced “poo-ree”) and is traditionally baked in a deep circular clay oven called a tone (pronounced “ton-AY”). 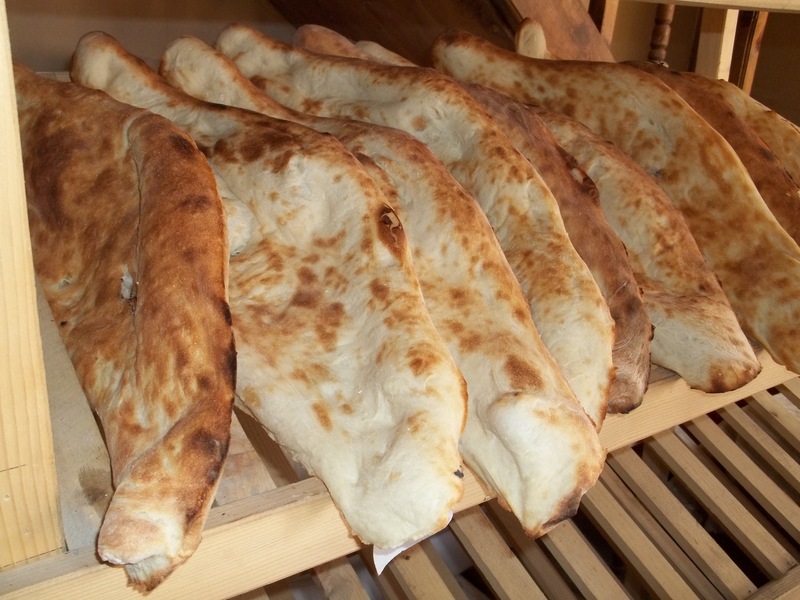 Traditional bread, especially the long pointed bread called shotis puri, is very popular and usually served with every meal. Most streets in Georgia have at least one traditional bakery. We went behind the scenes at our local bakery, Trepezi, to meet our baker and see how traditional Georgian bread is made. Our baker’s name is Zaur Skhirtladze and he comes from the Racha Region of Western Georgia. In earlier times all bakers came from Racha (Georgian: რაჭა) and they are generally acknowledged to be the best bakers in Georgia. When Columbus set foot in America and planted a sign saying ‘I found this land’ a man from Racha appeared from nowhere and told him ‘How can you say you found this land when I have been baking bread here for 30 years’. We are not sure if it is true but it made us laugh! 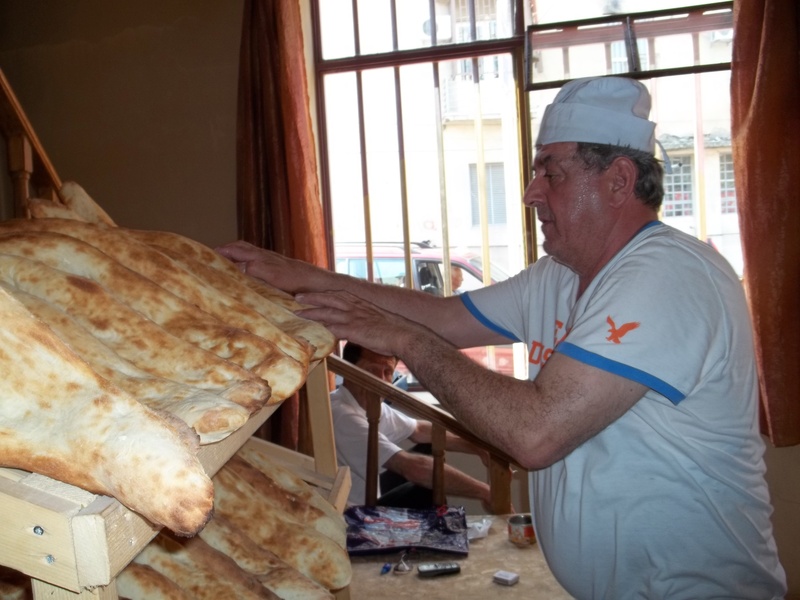 There is a tradition of bread making in Zaur’s family. His father was a baker in the Soviet Army during the Second World War. Although Zaur started working in a bread factory he left in 1977 to make handmade traditional Georgian bread. He was taught how to make it by his godfather and he told us that it takes time to learn how to make good bread. It takes much strength to knead the dough and much skill to place the dough inside the tone (oven) and take out the baked bread without dropping it in the fire. 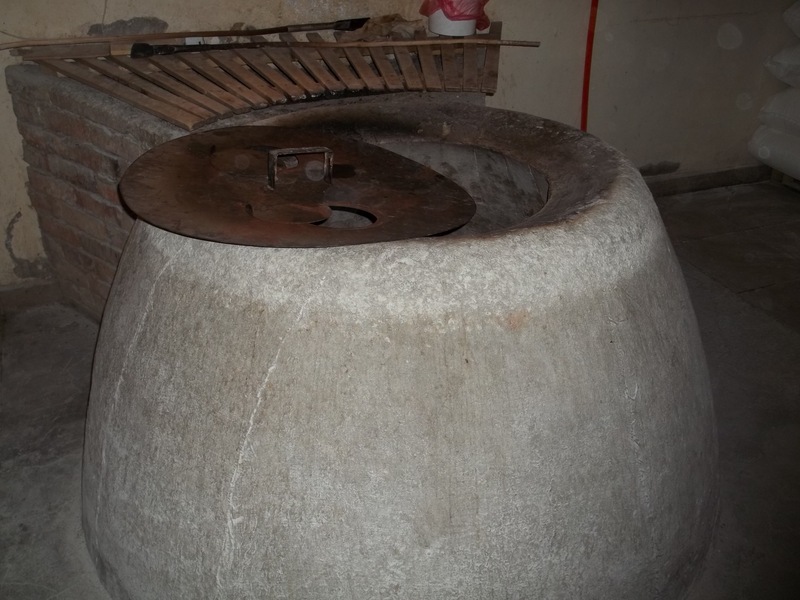 Zaur made the traditional tone oven that takes pride of place in the small bakery. Traditional tones are made of clay and burn wood but Zaur told us that the smoke damages the building so his tone is gas fired. The interior is lined with fire proof bricks. The outside is made of a mixture of special quartz sand which is used in making glass and a fire proof clay called Chamuti. This mixture is spread on the outside of the tone and wrapped in linen. When it dries it fuses into a hard, fireproof surface. This tone will last for 7-8 years before it will need to be replaced. The heat inside the bakery was phenomenal. When we mentioned this, Zaur laughed and told us that “You cannot bake bread in a cold tone”. More Racha humor! 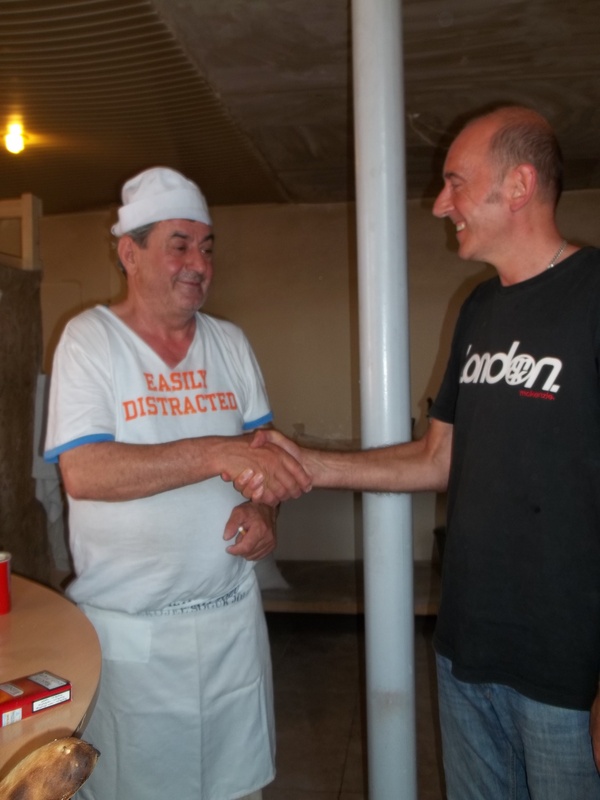 Zaur told us that his busiest time of year is at New Year. Huge quanties of bread are eaten during New Year feasts and customers queue for hours to collect anything from 10-50 breads! At New Year Zaur used 10 x 50kg bags of flour and made more than 1,400 loaves of bread. He mentioned that this is his physical limit for mixing dough by hand. He pointed out that modern bread factories use electrically powered mixers for the dough but you have to be physically strong to hand mix the dough (25kg at a time) when making traditional bread. We think traditional bread tastes great and we also think our baker is the best baker in Tbilisi! We stayed to watch Zaur making bread. Click here to see each step of the bread making process.